Ugandan Motor rally legend Emmanuel Katto without doubt enjoyed the biggest and most passionate fan base in East Africa. The 1995, 1996 and 1997 national champion is one of only four drivers to have won the Uganda National Championship three times in a row. The others being Sam Sali (1989,90, 91 &93), Karim Hirji (1993,94,95) and Charlie Lubega (2000, 2001 and 2002). Legendary driver has taken occasional breaks from the sport over the years due to business commitments around the globe but he is not done with the sport. In a 10-part series, dubbed ‘Emmanuel Katto Flash Back’ that will be published weekly on www.emkarally.com and www.emmanuelkatto.com we take you back in the day. Part 1 rewinds the clock 19 years back, in the UMOSPOC Rally, the opening race of the National Championship. 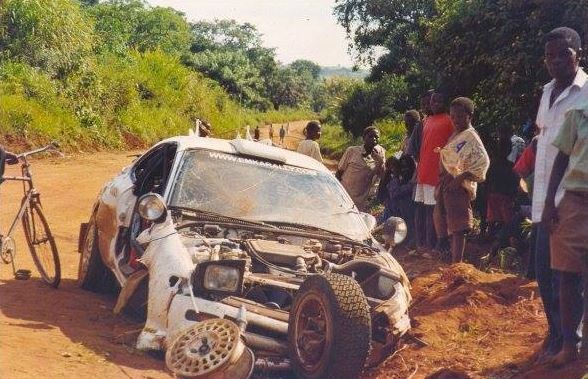 Katto, navigated by Kenyan Frank Gitau in a Toyota Celica ST185 plunged into a ditch, spectacularly flew so high and the impact on landing left the bonnet, door, suspension and tyres detached from the car. Katto and Gitau who surprisingly emerged from wreckage without any injury recount the accident that many spectators will never forget. The local road construction company had dug the ditch two feet deep and 10 feet wide across the road after recce a week before. We must have been 10 metres or 15 feet in the air, then hit the right hand side bank and started the roll another 150meters. The car came to rest on its belly with no front tyres and suspension, no door on right hand side. The engine was still running and Emka engaged first gear and we moved another 20 feet or so. That’s when it appeared we were not going anywhere. No scratches, just whip lash. I was still holding the current pace note page which I still have to date. Celica GT4 ST185 built by TTE and this was 1997. I am not an engineer but you can’t convince me that an impreza was safer than a 185 Celica. The 185 was one of the toughest cars ever built for the safari. We were doing over 200 km per hour and came out without a scratch. The chassis was 100% straight. That’s what I call a car. My accident in the pro-drive N10 was half the speed and the chassis was completely bent. You cannot even begin to compare the two cars. Next week in part 2: We bring you Emmanuel Katto’s exciting close battles with Karim Hirji and Charles Muhangi in the Pearl of Africa Uganda Rally. You will see the near misses that why Emma Katto is only Uganda legend never to have won the coveted Pearl Rally. What are most your memorable races involving Emmanuel Katto?